This is the new place. Try not to touch the walls, the paint is still tacky. Flo, can I get a cheese danish with my coffee. Training continues, GF has me and Bud both sitting on command. Ahhhh! The smell of fresh paint and even fresher coffee! A couple of scrambled eggs with cheese, sausage and grits, with a refill on the black coffee, please. Then, it is back to laying some track until the grass gets dry enough start cutting. Good morning everyone. 65 and sunny out there. I'll have scrambled eggs, really crisp bacon, and a big cup of coffee, Flo. Thanks. Hey - what's the best way to jump back to the previous month's forum? Over the weekend I continued fixing stuff around the house, changing out plugs and sockets, mowing, cleaning the swing that had developed some mold from all the rain this summer, etc. etc. Did get some time in the train room - cleaned the wheels on one of the engines using the alcohol and paper towel technique you guys mentioned - seems to be working better. But I'm waiting for some track cleaning supplies and a track cleaning car to come in with my latest MBKlein order - I want to clean the whole track properly. Made some more progress on that DPM structure. Just need to hang a sign on the front and put in the window decor and it's ready to take its place on the layout. I'll post photos when done. Good Morning All. 71° and mostly cloudy here. Looking at a week of pleasant weather coming up, highs in the mid-80's with lows around 70°. Time to get serious about outdoor stuff before winter comes in two more months. I still have two dead trees to cut down, and the plan is to start one today. Household chores first, wife is supposed to be coming home today after a 3 1/2 day babysitting stint with our grandsons. Dishes and laundry are already done, just need to sweep the entryway and back porch. Same old, same old out in the train shed. Finished re-attaching the top rail of the fence that I broke off Saturday. Still made some progress attaching the interior yard dividing mesh in a couple of places. Made some progress painting Preiser figures while waiting for glue to set and I finally set up the saw horses and cut some additional fascia board for the upper level, that project is about 65% done (upper and lower). Terry - Interesting video yesterday. Someone really did a lot of great work on that. Needs electric starters though. Justin - I don't participate in any of those "groups" or stuff on the Internet except model rr's , but my wife is in some political groups. Those people are downright vicious. For entertainment, she will post things just to see the reaction and has showed me their responses. Easier to be hateful when you're anonymous and not face to face. Garry - That's one heck of a locomotive. Sherrel - They had ski boats back when you were in HS??? Greg - You have that purchasing strategy worked out well. I dare not tell my wife about your wife's memorabilia room, lest I have to give up more space here. She just uses one corner of the guest bedroom, mostly Troy Aikman stuff. Curt - Whoa! Gas line leak is not good wherever it is. Open it in a different tab or window. Good morning. October ALREADY? Guess time flies when you're having fun. 30 degrees with an expected high in the mid 60's. Last night we had a thunder storm come through. Thunder storms aren't unusual, but the temp was 34 degrees. Strange. Greg - Sneaky little devil. Enjoy the RDC. I ghad thought about getting one, but it was a bit pricey for me. Terry .... Thanks for starting the new thread. Willie ..... Regarding "groups" , I follow some railroad groups in FB. I'm not a big FB user, but I am friends with a couple of guys here in the Coffee Shop. Chet ..... That's a spooky scene . Good Morning Everyone......overcast and lots of rain last night and more later today. Garry: Great job on modeling Union Station, my wife knew that it was Union Station the minute she saw your photograph of it. We were there last week and the tunnels are something else to see. I would hate to have to walk thru the tunnel at 2:00 AM. Garry, I like the way you installed the ground throw operating rods. October is here and where did summer go, but model railroading season goes in full swing around here. Today, many of my locomotives have start up sounds when track power is applied to the tracks. It's time consuming to shut these locomotives down, so I'm changing a couple of CV's in each locomotive to prevent the startup sounds. Brewers game is on at noon, but who knows what time the game may start if its raining. The game must be played today since the Brewers and the Cubs are tied for first place in their Division. If you want to view last month's coffee shop, navigate to the forum home page, scroll down to the "Anti Nit Pickers League Coffee Shop" subforum, click that, and click the title for last month's coffee shop. Terry - thanks. Wasn't sure how to navigate to last month's coffee shop. Got it now. By the way, nice cab ride video you posted last Friday. Justin - Thanks for the tips on how you do your ballasting. It did come out nice. I use pretty much the same tactics, but not as neat results. I'll have to take more time, I guess. Chet - That was a nice cab ride photo you posted last Friday, too. Nice photos from your club run. Some of these cab ride videos make me wonder, like the one Terry posted last Friday - where on earth do they build these layouts - - in an airplane hangar? Makes me jealous of Willie's barn - to have an entire barn to build in - - wow!! 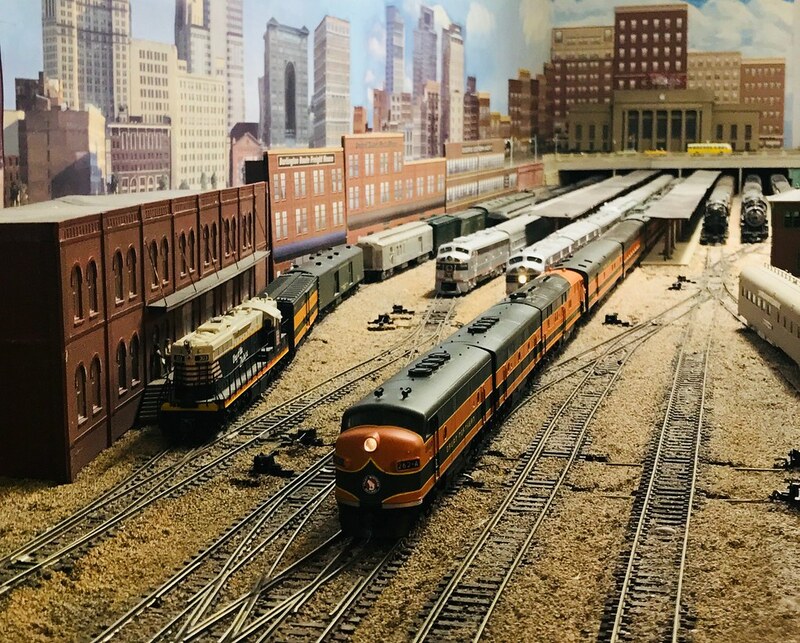 Annual train show hosted by the Tristate Model Railroaders, in Joplin, MO. Sat., Nov 24, 9 a.m. to 3 p.m. If any of you in the four states area (AR, MO, OK, KS) want to meet up there, let me know - would enjoy meeting you. Woo hoo new place! Sadly however it's a Monday. New round of heat again. Supposed to be hot all week long. Not calling for much rain though. Periods of isolated showers maybe. That's about it. Nothing new from the train room. I may do some more ballasting this week. Who knows? I'll come up with something I'm sure. Just a suggestion here, You may already do this but it isn't apparent from the picture that you posted the other day. I always paint the plywood a light brown or other earth color before ballasting. In this part of the world, ballast isn't so neat and evenly spread that some dirt doesn't show through. Working in the train room....but time for lunch, then I'll try to string some wires between utility poles; three electrical and two telephone. Going to use Berkshire Junction's product, EZ Line, a green line for electrical and brown line for telephone lines. Like Gerry Leone , I'll use canopy glue to hold the strings in place. Should be fun, I hope...you might be able to hear me voice a few choice words during the trail run..
You are absolutely right. If I look at any railyard from my time period it's more dirt than ballast with vegetation. Poor upkeep for train yards. Soil will be added next with a mixture of everything that would be found in a yard. My ballast is really thin. I may remove some as I go to add more ground details. It's a great recommendation and I'm on the same sheet with you on it. For the record the ballast isn't permanently down yet as I couldn't find my spray bottle. So removing it won't be too hard to accomplish. Chet: I just saw the photo you posted last Thursday....how do you keep the layout so dust free? Speaking of Dust Monkey's, after Chet mentioned using them, I remember that I have three or four cars with them installed and I just forgot about them. They really work in keep the dust off the tracks. I installed them on cabooses to help find them to check the pads for dust build-up. Found the new PECO flex Code 100 track that I'll sell on EBay. I found 18 - 3 feet sections that I'll sell. AND God Bless Donald Trump and the USA! And in the "ID10Ts walk among us" department, here is a photo of a 120 volt male connector that is lying inside a cabinet in an older trailer. It is live. Terry - I'm suprised that that camper hasn't gone up in flames years ago. Greg - My basement doesn't get a lot of dust thankfully. I have heard complaints about my vehicles being too clean, so what dust I do get I leave on the vehicles for "natural" weathering. I do have a few cars that I keep dust monkeys on plus a track cleaning car. DC locomotives also aren't as sensitive to dirty track as DCC locomotives are. If I wantr to find any problems with dirty track, I'll put a DCC locomotive on the track and it will quickly let me know where the problems are.